PYUNKANG YUL Acne Spot Cream is a special acne treatment that is enriched with Willow Bark Extract (Salicylic Acid), Madecassoside and other herbal ingredients to alleviate acne within 12 hours and stop acne-causing bacteria from spreading further. Suited for acne prone skin. If you purchase this product you will earn 23 Points! 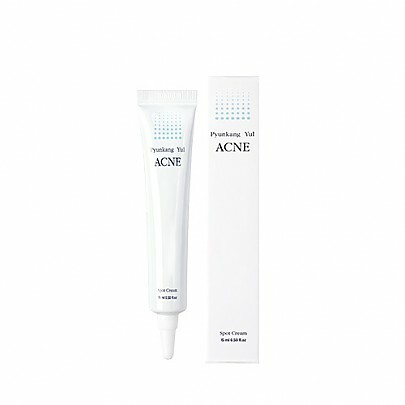 This acne spot treatment has a soft, cream texture that absorbs quickly into your skin. Willow Bark Water contains natural Salicylic Acid which will draw out excess sebum and bacteria from the targeted area. Madecassoside and other herbal ingredients promote healing and skin regeneration; effectively repairing skin tissue that has been damaged by acne. Salix Alba (Willow) Bark Water – contains natural salicylic acid (BHA) that helps to unclog pores, accelerate skin cell turnover and heal acne breakouts. Discover more PYUNKANG YUL here. Squeeze a small amount of cream onto your finger and apply it directly on the affected area. Follow with the Pyunkang Yul Acne Cream, or your usual moisturiser.